The other day I was flipping through TV channels and came across Ina Garten making a French Apple Tart. All of a sudden I remembered a recipe I grabbed off the internet a couple of years ago for the exact same thing. And then it hit me “oh yeah, I was planning to make one of those”. After watching Ina I jumped on the internet, had a quick look at her recipe, and scribbled a couple of ingredients on a Post-It note. A couple of days later, I got around to making it. I love sweets, and I love baking (as you might have noticed), and since this blog I’ve started thinking about putting my own spin on recipes. Normally I wouldn’t do this, I would follow a recipe because I assume the original creator knows best – and most rightly they do! I have a couple of my own recipes, and when it comes to Italian dishes and anything simple, I have the confidence to write my own. 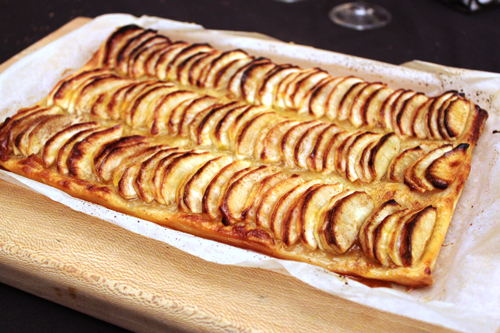 For this French Apple Tart, I decided to ‘research’ a couple of variations to base mine around. It stems from Ina’s, which you can find here. The result was something so lovely and light, but sweet (maybe a little too sweet so I’ve adjusted a couple of things below). When it comes to apples, it's safe to say that there are a few key ingredients that will always work, like cinnamon. So have a go at the one below, and if you want, adjust to how you like too. Preheat the oven to 200°C. Line a 25cm by 38cm tin with baking paper, and lightly spray with oil. If using frozen pastry, place the three layers on top of each other and fold in half. Using a sharp knife, cut the three raw edges off so they pastry has no dry edges. Roll out the pastry using a rolling pin and lightly dust with flour as you go. Roll until it fits the tray - it should be around 5mm thick. Use 1 tablespoon of apricot jam and spread evenly over the pastry. Neatly place the apples over the pastry and jam, overlapping as you go. Take the apples all the way to the edges. Sprinkle the sugar and cinnamon over the apple, then place the small cubes of butter evenly over the whole tart. Place the tart in the oven and bake for 45 minutes to 1 hour, or until golden brown. Just before the tart is done, place the remaining 2 tablespoons of apricot jam, the Cointreau and water in a small saucepan over a medium heat and stir, reducing the mixture to a smooth consistency. Remove the tart from the oven and brush the jam over the top, giving the tart a nice glaze. Absolutely love this tart, even the most inexperienced cook could attempt this...give it a go!! I made this last weekend and it was a huge hit.